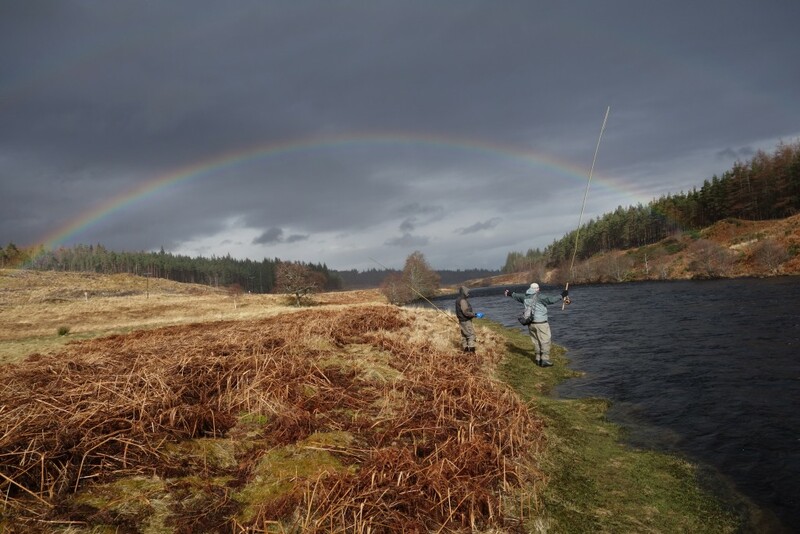 Somewhere there is fishing for bright Atlantic salmon, and right now that is Scotland. A fishing buddy George Watson and I just returned on 3/23 from two fun weeks of fishing the River Naver and staying at the Altnaharra Hotel. While we never catch a lot of salmon on this trip we get a few and had 8 fresh run fish that are locally called “springers”. 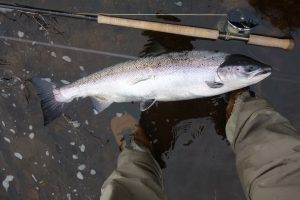 Fishing in Scotland is different than in Canada in that while we have the same system of private ownership that came here from the UK the estates that own the water do not normally have full-service lodges such as exist all over Atlantic Canada. Things are typically done on a sort of a la carte basis, with the estate providing the water, sometimes a guide or ghillie, and accommodations being booked through an area hotel. Sometimes the hotel will have access to fishing water and can put the whole trip together. Another difference as you can see from the photo above is that early March is very much open water and spring. When I got home Jason Curtis sent me an e-mail from New Brunswick that simply said it was still mid-winter in Blackville. Whether there is open water for the April 15 season opening appears doubtful, but things can change quite quickly. In case you have forgotten here is what a bright salmon looks like! This fish was 32 inches long, fat as a pig, and should weight about 13 pounds. I caught the fish on a Willie Gunn Waddington shank fly to which I add a palmered black collar hackle. I was fishing a Rio Scandi multi-tip with an intermediate tip. With their runs of these prized fish greatly reduced over the last 20 years virtually all spring salmon are now released in Scotland. Hopefully we’ll see the first of these on Miramichi in about 60 days. Even though the Miramichi is still frozen solid the signs of spring are everywhere. Here on the coast of Falmouth, Maine we have patches of bare ground, the chipmunks are out of hibernation, and blue birds and red wing black birds are at the feeder. They are projecting 57F for next Friday. As soon as the ice shows signs of giving way I’ll give you a report.